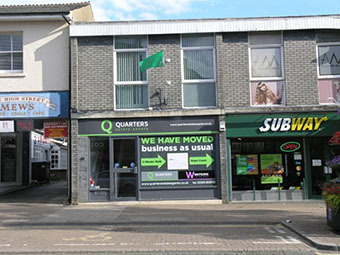 PRIME HIGH STREET SHOP PREMISES WITH FIRST FLOOR OFFICE USED AS A2 ESTATE AGENCY PREMISES FOR PAST 50 YEARS AND AVAILABLE DUE TO RELOCATION. The premises are in the centre of the High Street, with W H Smith and Costa Coffee and Wilkos and Peacocks close by and many other well known High Street retailers within the close vicinity. Leighton Buzzard is an expanding South Bedfordshire town within 40 miles of London and within 35 minutes train journey. This particular unit has been fully occupied since it was built in the early 1960s and is indicative of the excellent trading position in the High Street. The premises comprise a single retail unit of some 269 sq ft with a frontage of 15’3” and a depth of 17’8”. The flooring is of laminate flooring and the stairs are carpeted with a first floor area of 148 Sq ft, plus a kitchen and WC area. It is good decorative order throughout. LEASE TERMS: A new lease is available on a fully repairing and insuring basis, for a term of years to be agreed. The property will qualify for full small business relief, subject to the necessary criteria being satisfied. VAT: We are informed that the property is not registered for vat purposes. VIEWING: By Appointment with Andrew White and Co.